So in the last weeks I learned so much at my voluntary place, Crann Og Eco Farm. I got to know myself better. I learned a few new skills. And to my surprise I discovered that I actually didn’t enjoy some things that I longed for since a long time. You know, those things that you think you like and you daydream about them. Sometimes you need to know what you don’t want in order to know what you do want. Like peace and quiet. One of those things I always wanted more off. And now I am here, at this place with just a few people, and I actually miss more people around me. Or at least the possibility of people to observe or talk to. Somehow it makes me more connected to myself. Another thing is that I imagined myself in a little house in the woods, maybe even off-grid, back to nature. And at my current volunteer place I actually had the change to stay in a carabin (wooden house and caravan combined) in the big garden. And I passed. To actually make my own fire to be warm at night and to leave the building to go to the toilet, nope, that didn’t sound tempting at all. So I stayed in a bedroom in the main house. One thing I never realized before I went here, is that I need the possibility to look in the distance. Like at the sea, cliffs or near a big river. My souls needs it. I need it. I like the forrest and the garden here, but I miss a bigger view. All this, and a few other reasons, made it clear to me that I wanted to go to another voluntary place after a month here. So about two weeks ago I browsed through interesting projects at HelpX and Workaway. There are so many possibilities! And with my new knowledge about myself, I knew better what to search for. I got in touch with few places. Most of them didn’t have a place in the timeframe I was looking for. Others didn’t really match I discovered after some mailing. In the meantine I was also in touch with my former manager at Dzogchen Beara, the place were I volunteered for almost half a year. And end of this week I am going back there to volunteer! A few weeks working and living in the hostel again. And a few weeks assisting with accomodation manager tasks when someone is on holiday. I will also get a more private place to life then. I am really looking forward to that place that feels like home, the people, the meditating, the great lunches and the beautiful view. Time for new experiences on a familiar place. And I take all the new skills and nice memories I made at the places where I am now with me. This entry was posted in Life and tagged learning, life, personal, skills, volunteer, volunteering on March 8, 2017 by Katja. I believe that thoughts are some kind of energy. Negative thoughts will bring more negative in the world. Positive thoughts bring more positive in the world. To simple? Maybe to some people, but it is a fact that you can only have one thought at a time (although it may seem like more if you have a busy mind, I know how that can feel..). And as a human being you’re almost always having thoughts anyway, so why not choose to have more loving ones once in a while? For the last weeks I had the opportunity to be more online and I followed the news and Twitter more than the months before. A bit was inspirational and for the rest I felt sometimes powerless and overwhelmed about a lot of things that are happening around the world. And with people. Big things. Small things. Just lots of things. Until i suddenly remembered the Loving Kindness meditation. Yes, that’s what I always can do! Send more positive thoughts into the world. I have a reaction anyway, and at least I feel better myself when I make it a more positive one. 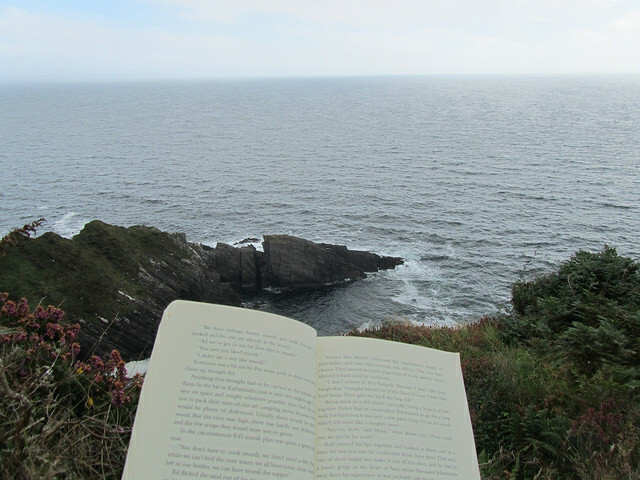 During my stay as a volunteer at Dzogchen Beara -Buddhist retreat center in Ireland- I got to know the power of Loving Kindness meditation. I had to get used to it, and after a whole weekend retreat about it, realised how loving and powerful it is. For myself and others. What it is? It is a timeless spiritual truth that we all have an immeasurable treasury of love within us. 2,500 years ago the Buddha taught his disciples the meditations on Loving Kindness as a way to reconnect with that inner wealth. In modern times these meditations still provide gentle yet powerful tools for opening our hearts and minds. (source: Dzogchen Beara site). To simplify it: the basic form is to sit quiet, connect with the universel love -or a holy person that you feel connected with- and repeat phrases like: ‘May I be well, may I be happy’ to yourself in your head. You can later expand it by saying ‘May you be well, may you be happy’ to other persons. (I’m not an instructor, so if you really want to know more about it, go follow a good course, or read a good book about it, like this one from Sharon Salzberg). So instead of looking at the news and feel annoyed or flabbergasted by someone or something, I send Loving Kindness to that person. ‘May you be well, may you be happy’. And if I feel that a whole group of people are acting in a way that I don’t think of as loving to others (or themselves), i’ll say something in my head like: ‘May you all be well, may you all be in harmony with each other’. In this form I don’t sit down to meditate for a while first, I just focus on those sentences. If anything, I feel better myself if I choose to do this, instead of being grumpy or angry or fed up with others. And if I feel better, than I am developing me inner peace and bit by bit that also leads to a more peaceful world. And the most powerful thing for me is: there is always a choice. You can always choose how to react on things and people. Isn’t that a wonderful and strong idea in a world were we get so much information all the time! This entry was posted in Life and tagged kindness, love, Loving, meditation, Peace, positive, thougt on March 7, 2017 by Katja. Did you ever notice how news is delivered? It mostly negative, zooming in on what’s going wrong and what’s not working somewhere in the world. Lots of people think that this is a good representation of how the world is. I am not so sure about that. I do believe that the world is how you look at it. So if you think the world is mostly a bad place, you’ll find loads of examples that match your view. And if you think that the world is mostly a nice place with good people in it, you’ll find proove of that everywhere. I am so moved by her words and actions, that I will share a few of my favorite parts of the book. This is one tiny small act of bringing more love in this world. And I do believe that all tiny and big acts of all people together go a long way. So why not go a peaceful way? Want to read more? You can download her book -for free- on the site about her. 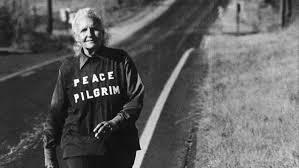 This entry was posted in Life and tagged book, good, love, Peace, pilgrim, walking on February 19, 2017 by Katja. 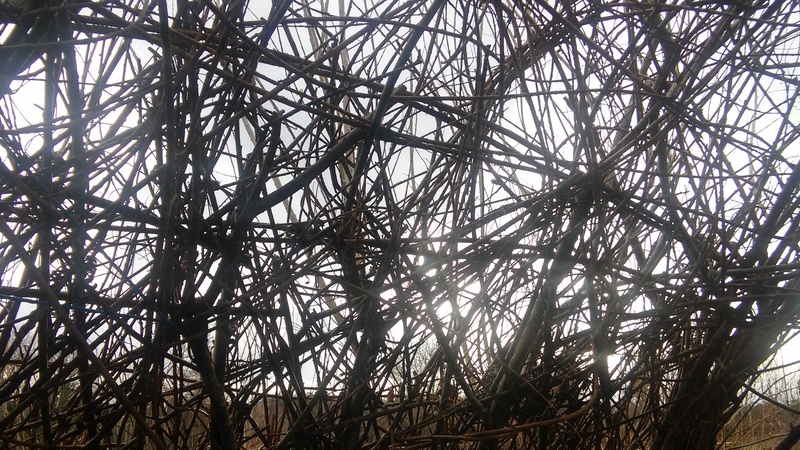 I realised that today, when I was weaving living willow. I had never done that before, up until this morning. And at the end of the day I knew how to do it and already had a few hours of experience. Ofcourse, it is easy for me to learn new things, because my life is a letting-go-adventure since I left my house last August. It is easier for someone to learn new things when you’re not surrounded by everything and everyone that you’re used to. At least, that’s how it works for me. In a new environment it is much easier to think ‘I might be able to learn this new skill’, because everything is changing all the time anyway. This way I give myself room te explore myself more and more. Although today, while weaving the willow, I realised that it is actually this easy to learn something new. You just have to start somewhere. Help someone with something. Decide to take a first step. Ask a friend if you can see how they do it. Read a book about it and go do it. Watch a video and practice. Improve your skill by be a volunteer. Ask your colleague to explain a new thing. And you don’t have to be good at it from the start. It is about learning. Practicing. Playing with it. Exploring if it is something you would like to learn more about. Or not. 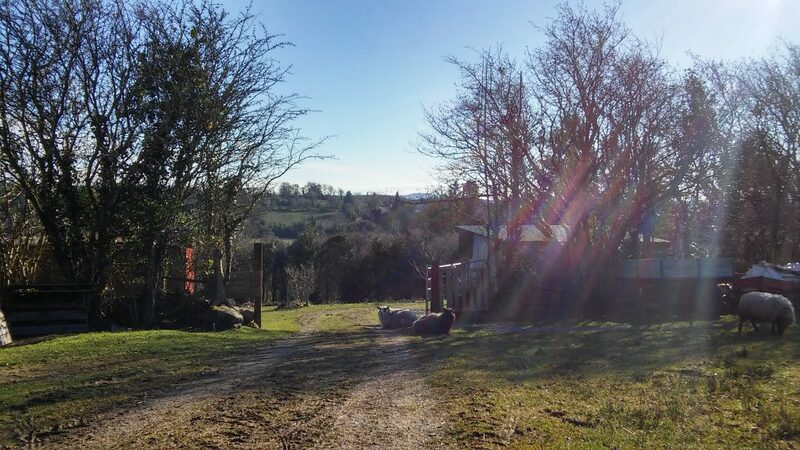 I am giving myself loads of opportunities at the moment, because since a week I am volunteering at a new project in Ireland: Crann Og Eco Farm. Already in one week I know so much more about ecological living, animals, cooking and gardening. So, what do you want to learn and when will you start with that? This entry was posted in Life and tagged farm, learning, New, skill, thing, Willow on February 16, 2017 by Katja. Not because I never watched, but because I couldn’t stop watching once it was one. When I was a kid I loved music clips and series. I have to say that my knowledge of the English language improved by that. And there was much less broadcasting when I was younger, so yes, I also had plenty of time to play outside with friends and read a lot. Later in life I still liked to watch. And I always got sucked into other storylines as well, while zapping in the commercial breaks. I didn’t have enough self-control not to watch. At a certain point I decided to get myself a monthly subscription to a package with loads of tv-channels and the possibility to record programmes. A few days later I got the news that I was picked to live at my own room within a communal house. I was going to live on the second floor on a building with high rooms, so there were lots of stairs. I decided then and there not to drag anything up that stairs that I wouldn’t consider as useful. And I made the choice to get rid of my television. And you know what: I never missed it. There were some times that I really wanted to watch things on a screen and then there were websites where I could watch tv series and programmes. Or I would watch a dvd. I never wanted to learn how to download movies or series, because I know ther was a big change that I would watch way more than I would actually like. In the last years I occasionally stayed in houses of friends for a few days, to mind their house and cats and or plants, and if they would have a tv, I would eagerly go for it. After a while I always got bored, annoyed or overwhelmed by it. A few weeks ago I was in the Netherlands for a week or two. Because I quit my rent before I went on my lettin go adventure I stayed with several friends. The last week I stayed at the house of friends who were going on holiday. And I discovered that I still was drawn to watching tv more than I think I would like. A part of me was ok by that, also because this was after all my holiday in between working as a volunteer with less private space for months on a row. A part of me was not ok by that, because I also could spend more time on meditating, reading and writing. So I watched 22 episodes of a serie, the history of hiphop (I thought it was only 45 minutes instead of 4 episodes of 45 minutes… Of course I had to watch them all), a great documentary about background singers and a cheesy and nice comedy about love. It was all quit informative, entertaining and interesting, but I also realised why I don’t want to watch that much: it all takes space up in my head and it sips into my dreams, so I’m partly processing other people’s stories instead of my own. And it also messes with my sleep: I went to bed later than I would feel like kt, because the thing I was watching wasn’t finished yet. Since a few days I am at my new voluntary project in Ireland. With no television. So more time for other things, like enjoying the view, reading a book or writing this blog. This entry was posted in Life and tagged Netflix, television, Tv on February 10, 2017 by Katja. Which wish is bigger than my fear? 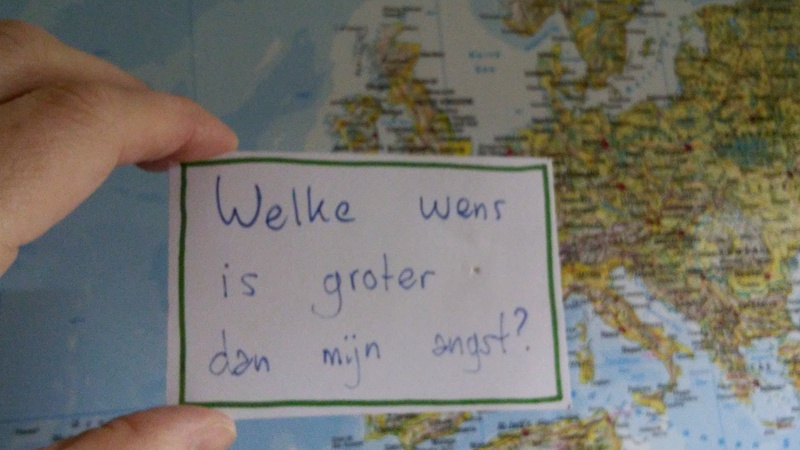 A few days ago I was browsing through on of the boxes that I left in The Netherlands and I found a note that I wrote to myself a few years ago. Translated from Dutch it says: “Which wish is bigger than my fear?”. I totally forgot about it and it took me by surprise to see it again. Because I was actually living my wished life for the past months. I overcame my fear. I took the step. Last summer I decided to follow my heart and combine a few dormant desires: quit my rent, get rid of loads of stuff and leave The Netherlands for a while. I decided to go to Ireland to do some voluntary projects for room and board. No idea what would follow and when I would be back. 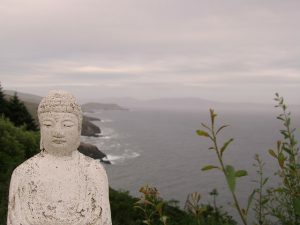 I ended up as a volunteer for 5 1/2 months in the beautiful, interesting and great Buddhist Retreat centre Dzogchen Beara. Since a few days I’m back in The Netherlands. Just for a week or two, then I’ll go back to Ireland to do more voluntary work. For lots of people this probably doesn’t sound like a life you would (day)dream about. But it was for me. What is the worst thing you think could happen if you follow your heart? What would you gain in your life if you would follow your heart? What would you do if you would win the lottery? Of course I asked these questions to myself as well and for years I answered: “I want to go away for a while, be more offline and experience how I am without the things, people and habits that I’m used too.” That was my wish, my longing. And then there was the fear. And insecurities. Can I just go away? What if I don’t like it? Will I miss things after I get rid of them? How do I do that with money? How do I arrange all the practical hassle? That stopped me from thinking seriously about it. And, as it goes with longings, last summer a few things didn’t work out for me and it all collapsed. And in that, everything came together and became clear: this was the moment. I am going to do it. The interesting part for me was that the moment I made that decision, most of the fear and insecurities faded away. They were just not relevant anymore. It was all replaced by answers, excitement and a deep knowing that it would all work out. And that this was the best possible thing to do at that time. I never regretted it for even a second. I also realize that fear is never a fixed state of mind. If you face it, it moves. You can try to hang on to it. Or explore and play with it. It’s up to you. This entry was posted in Life and tagged desire, dream, fear, life, longing, plan, questions, wish on January 24, 2017 by Katja. 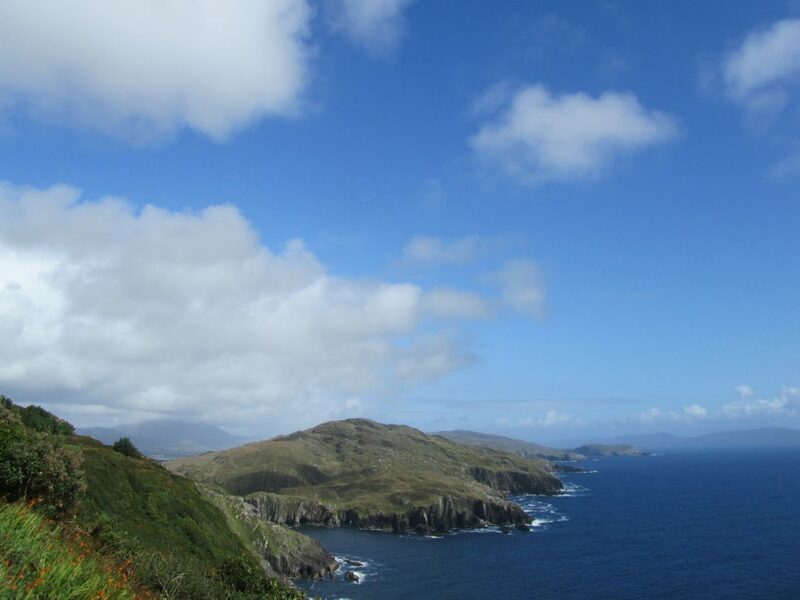 In a few days I will be leaving Dzogchen Beara, the place where I came in August to do voluntary work for two months. Instead I stayed for 5 1/2 months. If you would have told me before I planned to come here that I would sleep in a dorm for months, I’d probably have said to you that you were crazy. Because it sounded like a very unlikely thing for me to do. 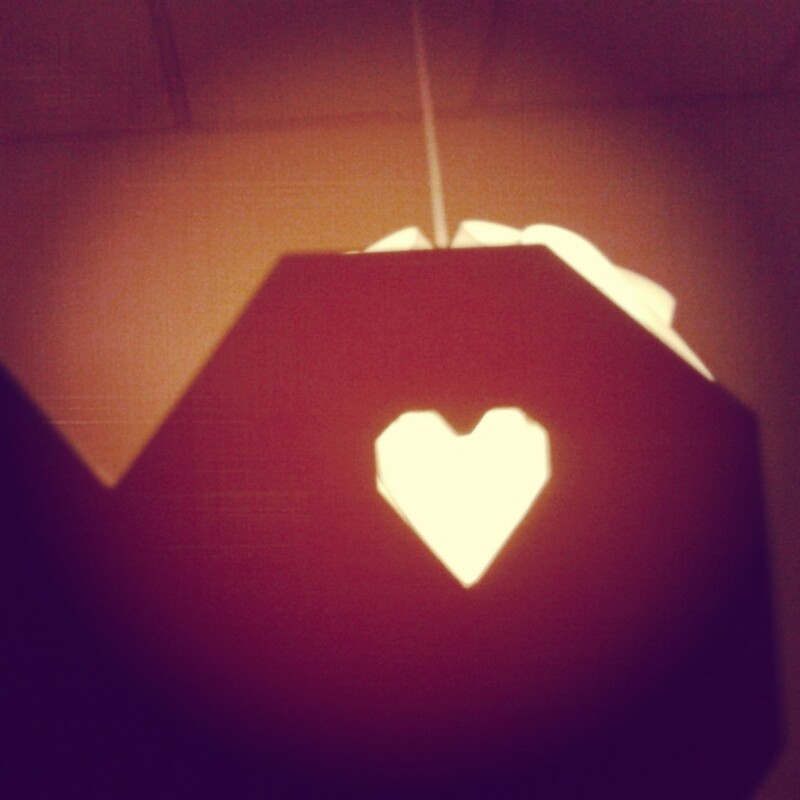 Since I’m quite sensitive, to light and sound and well, everything. And in need of my own space and alone-time every now and then. But I made the decision to come here. And it went fine. It is a nice hostel to be. We’re in the middle of nowhere and there is no alcohol allowed here , so people don’t stumble in drunk in the middle of the night. And most people come here for some peace and quiet time and go to bed early. And yes, there were moments that I couldn’t stand someone with a massive flashlight (or so it seemed in the dark dorm), a loud plastic bag, talking to me when I just woke up (I need some time before I get social) or snoring next to me. But most of the time I coped fine. I meditate almost every day here and had the pleasure of participating in lot of retreats about meditation, Loving Kindness and compassion. This all makes it easier for me to annoy myself less, to let things and people be as they are. Without judgement. Without making a whole story in my head about it. In a few days my adventure here is over. I will go to the Netherlands for a little while and then back to Ireland to do more voluntary work in different places. I hope, and presume, that I will take some of the meditation, insights, peace and Loving Kindness with me to the ‘outside’ world! 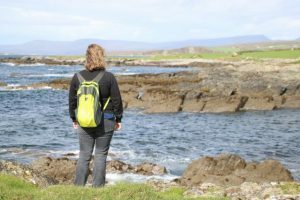 This entry was posted in Life and tagged beara, dzogchen, go, hostel, ireland, letting, voluntary, volunteer on January 15, 2017 by Katja. Living for more than 5 months in the dorm of the hostel of this Buddhist center, at the end of a cliff. I would like to be alone. Or go to the cinema (the closest one is an hour drive away). Or use the internet where and when I want. Or eat on my own. Or write on my laptop (which I didn’t take with me). Or talk to a specific friend who is in the Netherlands. Or walk to a supermarket (the nearest one takes only a 15 minutes drive, but since I don’t have to care, I have to find a lift or hitchhike). Sometimes i want things like that. But I realize by now that i want them for a little while and then the longing or wanting passes by. The daily guided mediation helps. The peaceful surroundings too. It is quite liberating to be in this place in my life where not all of my needs or urges can be fulfilled right away. Or in a few days, weeks or months. Because everything passes. Longings come and go. It is very good to experience that. It feels more peaceful to me. And I feel that there is more time and attention for other things. Like having really good conversations, enjoy my food more, pet the cats for a long while, read books, write, contemplate on life, look at the stars, be amazed by the passing clouds and the sun on the sea, enjoy the Robins that come so close here. And hopefully I can bring that feeling with me when I leave here next week, and go back to the ‘other’ world. 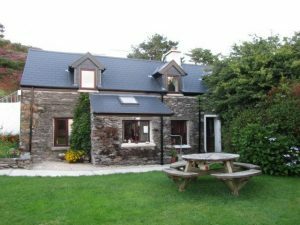 This entry was posted in Life and tagged away, beara, dzogchen, hostel, ireland, offline on January 11, 2017 by Katja. A few years ago I read something about a gratitude jar. I loved the idea and started one at the 1st of January the following year. It was a big glass jar. Every evening before I went to sleep I wrote something down that I was grateful for that day. Some days I couldn’t choose, because the day was filled with nice and good things. Other days I really had to think hard to think about one possible thing to write down. No matter what kind of day it was: I always wrote something down. It would vary from being grateful for a lovely time with a friend, seeing beautiful clouds, having a good meal, doing nice work, reading an interesting book: it could be anything. 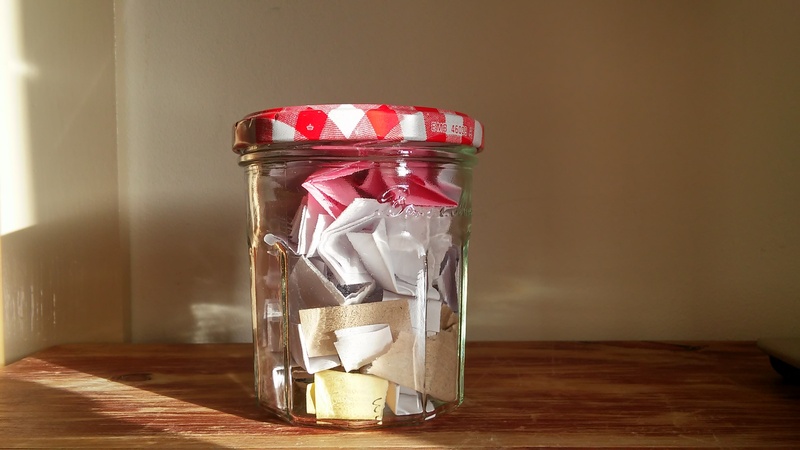 At the end of that year I emptied my jar and read all my little papers. It felt so good to do that. The joy of having 365 little papers, 365 memories of things, situations and memories that made me grateful. A very interesting side-effect of collecting those papers in a glass jar is that I could see the jar filling up. So even looking at the jar and seeing all those papers, made me already more happy, grateful and thankful. Another interesting side-effect was that it made me realize what really made me happy in my life. The year before I stopped my own enterprise I already noticed that I wasn’t enjoying it as much as I did the years before, because my work was hardly ever mentioned on one of my papers. This year I emptied my jar in August, just before I left my home and was getting rid of lots of stuff, to do voluntary work for a while in Ireland. (read here how that came about). And a few months ago I missed my jar. So I took an empty jar and started again. 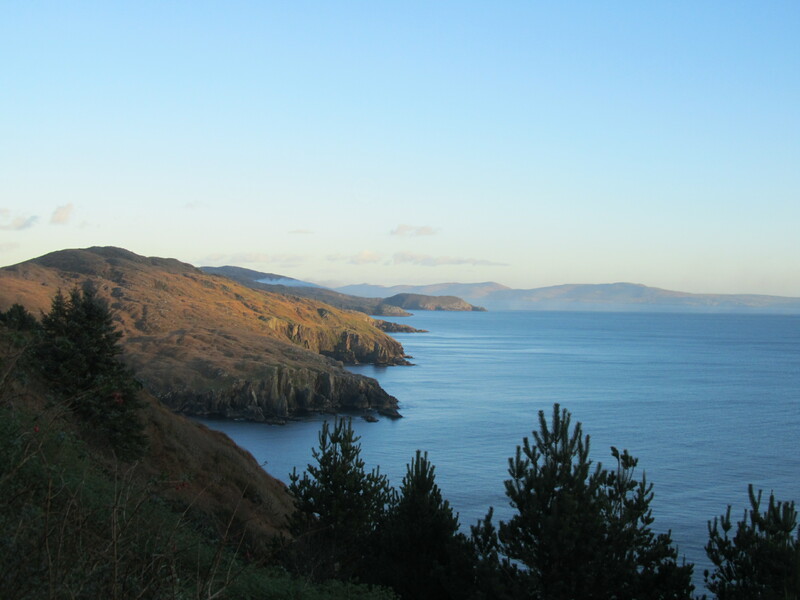 In a few days I will empty it and look back at my time here in Dzogchen Beara. And look forward, to who knows what kind of adventures and meetings in the next year. This entry was posted in Life and tagged grateful, gratitude, happy, jar, memories, thankful on December 28, 2016 by Katja. You can imagine that if you life and work in and around a hostel for about 4 1/2 months, like me now, there are always people around you. Loads of them. Some are coming for one night, most for two to thee nights, some for more nights and few of them for a week, or two. 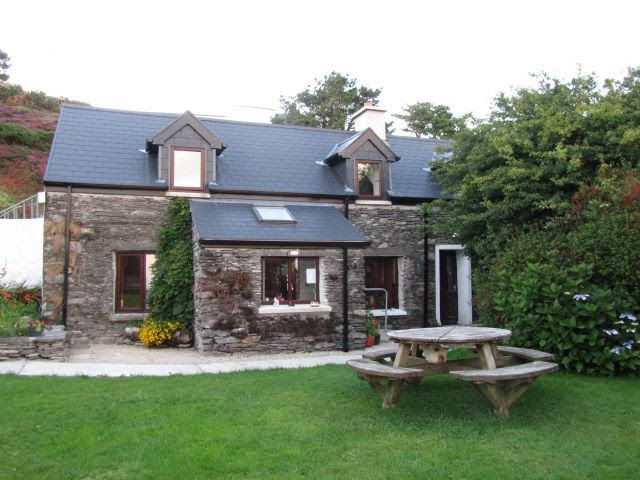 Besides the hostel there are the guests that stay in the rooms in the Care Centre or in one of the cottages. Also there are buildings where people stay who are on a personal retreat. Some for a few nights, some for a few months. Then there are the people who work and volunteer here. And of course all the people who just come for one of the morning or afternoon meditations, or to go to the lovely bookshop/cafe. I have had so much good conversations, loving greetings, interesting encounters, funny moments and warm goodbyes. And although I’m quit an optimistic person who tends to like people, I also had some boring conversations, cool greetings, irritating encounters, annoying moments and awkward goodbyes. But there were less of them. I am a person that needs her alone and quite time on a day. And even with all these people around all the time, I could find the time and place for that as well. It helps that there is a quiet meditation room here. That there are always cats to pet and sit outside with. And I also had to learn to be on my own with people around me. A valuable lesson. Altogether I feel privileged and thankful to have met so many interesting, sweet, lovely and nice persons. What’s also interesting to me, is that sometimes I had a great connection or deep conversation with someone that I just met a few minutes ago. It is a special place with good energy here that attracts nice and interesting people, that’s for sure. Some people I’m still in contact with, others I will meet again someday, others are nothing less than a good memory. “Imagine that everyone is enlightened except you. Richard Carlson- don’t sweat the small stuff. This entry was posted in Life and tagged hostel, life, people on December 22, 2016 by Katja. Enter your email address to subscribe to my blog and receive an email of my new posts. Why leave when you feel at home?